What are the Best Shaker Bottles or Cups? Home » Accessories » What are the Best Shaker Bottles or Cups? Are you looking for the best protein shaker bottle? Do you live an active lifestyle? Do You need your protein on the go? Shaker Bottles are the best solution for this, but they all do not work effectively. Shaker Cups come in in all shapes and sizes and we are here to provide you with a list of the best protein shaker cups on the market. Here are a few things you should look for in a good bottle. 1. Mixing Element: First, you should look for one that will at least mix your protein without Leaving you with big clumps of powder protein balls to swallow. A good mixing element is a must for your shaker to give you a quality protein shake. A stationary mixing element is ideal, but there are also some good wire whisk balls that work also. 2. Odor Resistant: This is just as important as how well it mixes the supplement. Sour protein is as about as bad as smelling a sewer system. I cannot count the times that i have opened my shaker bottle and had my face blown off by something that smells like a nuclear waste field. Make sure that you find a cup that is odor free. 3. Durability: Finding a cup that can stand the test of time is always my goal. I like for my shaker to be just as tough as I am in the gym. A durable cup won’t allow for spills and drips. Many Shaker cups spill and drip and have you needing a baby bib at the gym. Always look for one that can take a pounding. 4. Other Nice Features: We also want our cups to be chemical free, have a nice grip, and of course it has to match our swag. Ok, having a colorful cup to match your swag is not that important, but that’s what i like and ladies should get a pink shaker. The big bonus feature to look for is storage. A shaker bottle with storage can let you have the now shake and the later shake or just store your multivitamin. Needless to say, Shaker cups you want a cup that can live up to the fitness lifestyle. Now that you know what features make for a great shaker bottle, we will now give you our list of the best protein shaker bottle or shaker cups. The Cyclone Cup Shaker Bottle is our number 1 cup. This has got to be the most durable shaker that i have ever owned and not only that it looks awesome. The Cyclone Shaker goes against the grain with an integrated stationary mixing element. The majority of the shaker industry utilizes a floating mixing element like a wire whisk ball which can be ineffective. The cup never leaks and it is odorless. Once, I left it in my back for a week with protein and almond milk in it and to my surprise, it had no odor and i still had my face. Buy the top shaker on the market. Blender Bottle Prostak is manufactured by one of the most popular shaker cup brands and that’s Blender Bottle. My first cup was actually a blender bottle and it was effective at the time, but i must say that this company has a much improved product. The Blender Bottle Prostak utilizes the wire whisk mixing system. The whisk system by blender bottle is probably the best in the industry and has received positive reviews. This cup is also leakproof and has expandable store features. What leaves it a few steps behind the Cyclone Shaker is that it does not fight the odor as well. Other than that it is still a great shaker. 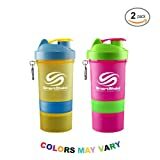 Get yours today from Amazon. .
SmartShake 3 in 1 is a little cheaper than the previous two shaker bottles, but it still holds up in quality, durability, storage, and odor resistant. I mean, we have the smart phone, smart watch, and the smart tv, why not have a smart shaker right? The cup is spill proof and is considered one of the best innovations I have seen in the bodybuilding industry by Jay Cutler.